Used For: The herb is used to induce urination, treat heart conditions, stimulate the body, and treat constipation. It is known to contain mucilage. Conventionally, the remedy was thought to calm the heart and relieve its problems. It may be applied in convulsions of various types, giddiness, and epilepsy. Additionally, the herb is applied to relieve apoplexy and palsy. It is an excellent brain stimulant, beneficial for mental activity. 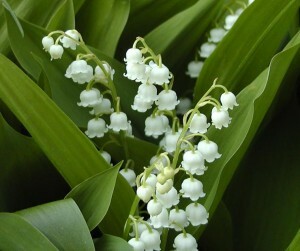 Lily of the Valley is found effective in dropsy. Used in large quantities the herb may result in diarrhea or vomiting. Due to its toxic content the herb is not recommended for internal use. Preparation and Intake: Not suggested for use. Safety: Warning! The plant may produce a poisoning effect due to its toxic content. It affects heart in a way identical to digitalis, and should only be applied under medical control, if applied at all.